This is a Drum machine, Synthesizer/Sampler/Sequencer with Programmable Kits, 2.5MB Sample Memory, 16 LFOs, Step Sequencer, Effects and more. This is a really nice drum machine for the money. It has classic sounds that you can shape and make it sound how you want. The on-board sequencer is powerful for putting incredible patterns together. It also has a 12-bit sample engine and you can apply effects to any sound. 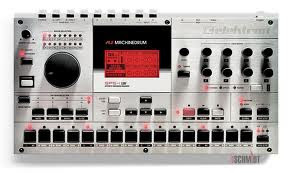 All in all The Elektron MachineDrum SPS-1 UW MKll is truly amazing for the modern producer/DJ. For more info visit Elektron here. This drum machine combines extremely flexible drum synthesis methods with a sampling engine. The powerful sequencer is the icing on the cake. It has classic sound. Thanks for share this information about drum machine.